Spinal arteries are branches of both vertebral arteries. The two anterior spinal arteries fuse together to form one major anterior spinal artery (ASA) just after its origin from vertebral artery and descends down through the anterior median fissure. Two posterior spinal arteries run along the posterolateral aspect of the spinal cord. 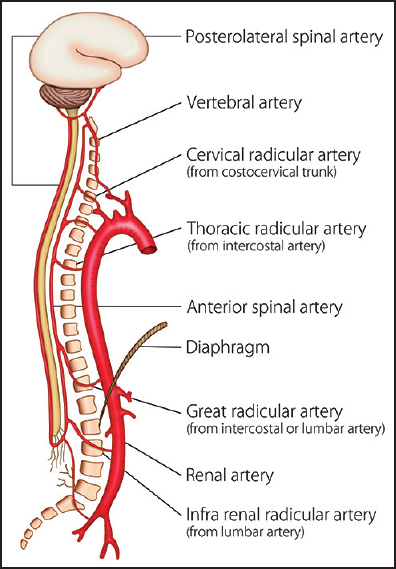 These spinal arteries become small as it traverses down and are reinforced at various levels [Figure 1]. Branches of internal iliac artery [Figure 2]. The extent of collateralization is not homogenous across the whole length of the spinal cord, which leaves some areas more vulnerable for ischemia. 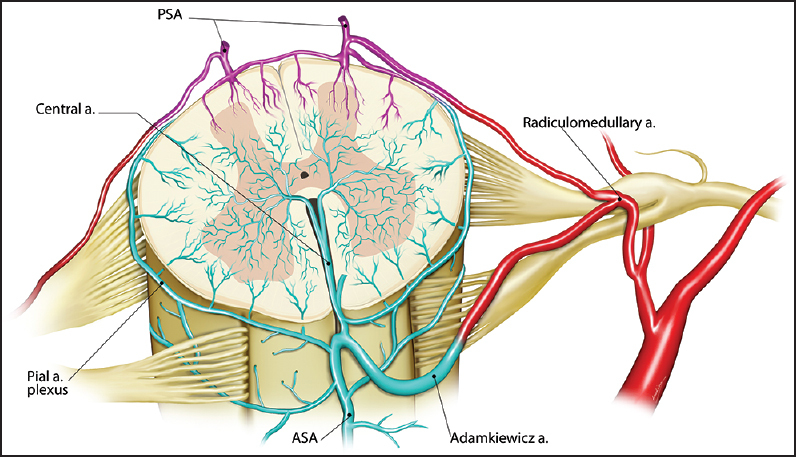 Even though, there are 31 pairs of radicular arteries, the number of anterior radicular arteries, which supply the ASA are much less than posterior radicular arteries, which reinforces the posterior spinal artery circulation. The cervical ASA receives a mean number of 0-6, the thoracic ASA receives 1-4, and lumbar ASA receives 1-2. Type I: Involves the subclavian artery and extends up to the renal artery. Type II: Involves the subclavian artery and extends to the bifurcation of the aorta in the pelvis. This aneurysm spans the entire length of the thoracoabdominal aorta. Type III: Involves the middle of the descending aorta and extends to the bifurcation of the aorta in the pelvis. Type IV: Involves the upper portion of the abdominal aorta and extends up to the bifurcation of the aorta in the pelvis. Zoli's et al. observed that the spinal cord ischemia is more in Type II and Type III aneurysms (15% vs. 3%). Griepp et al. conducted an elegant study of spinal cord circulation and impact of ischaemia in juvenile pigs. A mixture of methylmethacrylate was injected into the circulation of few pigs in the native state and subsequently in other pigs after the sacrifice of all intercostal and lumbar segmental arteries. They found the development of an extensive network of vessels connecting paraspinal muscles and the spinal arteries as early as 24 h of onset of ischemia. Their experiments challenged the previous notion of overemphasize of a single prominent radicular artery. The rationale of preventive strategies is that anatomic occlusion of few blood supply to the spinal cord can be overcome by physiologic methods periprocedurely. These include strategies to augment spinal cord blood flow, increase spinal cord tolerance, decrease ischemic time and early detection of spinal cord ischemia. Peroperative events such as hypotension, hemorrhage, hypovolumia or increased cerebrospinal fluid (CSF) pressure, which all decreases spinal cord perfusion have found to increase the risk of paraplegia in aortic procedures. Reduce/stop antihypertensives medication on the day of procedure. Adequate hydration should be ensured. Mean arterial pressure should be kept >80 mmHg. Increase the mean arterial pressure by >5 mmHg if spinal cord ischemia sets in. Lumbar CSF drainage if CSF pressure increases above 10 mmHg. Coselli et al. done a randomized study of CSF drainage in 145 patients who underwent surgical thoraco abdominal aortic aneurysm repair. The target CSF pressure was 10 mmHg in the intervention group. Despite the two groups had similar risk factors the incidence of paraparesis was significantly higher 13% versus 2.6% in the control group. A 5.0 F silicon lumbar catheter is introduced (24 h prior to heparinisation) into L3/L4 subarachnoid space via touhy needle. The catheter is connected to the pressure transducer and a drainage set. Transducer zero point set at patients level of the spine. When CSF pressure exceeds 10 mm Hg fluid is drained with the aid of gravity at a maximum rate of 15 ml/h. Usually catheter will be kept for 2 days and cessation of heparin prior to the removal of the catheter is also ensured. Hypothermia decreases the metabolic demands, protect the cell by stabilizing membranes and attenuates the inflammatory and excitotoxic response to ischemia during reperfusion. Early detection of spinal cord ischemia intraprocedurely and corrective measures to augment spinal cord blood flow can reduce the incidence of paraplegia. Intraoperative monitoring of somatosensory evoked potentials (SSEPs) or motor evoked potentials (MEPs) has been found to be useful in detecting spinal cord ischemia in anaesthetized patients. , So strategies like vessel reimplantation, appropriate CSF fluid drainage, hypothermia, increasing mean arterial pressure can reverse the neurologic abnormalities. Somatosensory evoked potentials detects the integrity of lateral column of the spinal cord while MEP detects the anterior column functioning making the second one a superior option, but it is technically complex [Figure 4]. Intraoperative monitoring of SSEP is performed by placing stimulating electrodes on the skin adjacent to peripheral nerves in the arms or legs. Electrical stimulation of the peripheral nerves generate potentials that can be measured from electrodes at 3 levels (popliteal fossa, cervical and cortical). The Rule of 10/50 implies a latency of 10 s and decrease in amplitude by 50% from baseline recording considers spinal cord ischemia. Motor evoked potential involved measuring the extremity muscle myogenic potential after delivering a stimulus over the motor area. This is more sensitive, But technically complex and has to avoid neuromuscular blockade. Studies analyzing surgical repair and stent graft repair could not find statistically significant difference in the incidence of this complication. Cases of spinal cord ischemia in open surgical repair have an early onset, more profound deficit and less chance to resolve when compared with stent graft procedures. 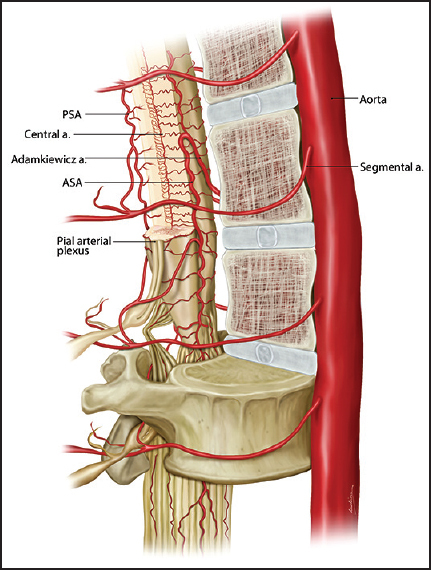 Spinal cord ischemia is a dreadful, but most often a preventive complication of thoracic aortic aneurysm surgeries and stent graft repairs. Avoiding hypotension, hypovolemia and hyperthermia are effective measures for prevention. Lumbar CSF pressure should be monitored at least in high-risk cases. SSEP monitoring is useful in early detection in surgical aneurysm repairs. Griepp EB, Di Luozzo G, Schray D, Stefanovic A, Geisbüsch S, Griepp RB. The anatomy of the spinal cord collateral circulation. Ann Cardiothorac Surg 2012;1:350-7. Etz CD, Kari FA, Mueller CS, Brenner RM, Lin HM, Griepp RB. The collateral network concept: Remodeling of the arterial collateral network after experimental segmental artery sacrifice. J Thorac Cardiovasc Surg 2011;141:1029-36. Zoli S, Roder F, Etz CD, Brenner RM, Bodian CA, Lin HM, et al. Predicting the risk of paraplegia after thoracic and thoracoabdominal aneurysm repair. Ann Thorac Surg 2010;90:1237-44. Greenberg RK, Lu Q, Roselli EE, Svensson LG, Moon MC, Hernandez AV, et al. Contemporary analysis of descending thoracic and thoracoabdominal aneurysm repair: A comparison of endovascular and open techniques. Circulation 2008;118:808-17. Griepp RB, Ergin MA, Galla JD, Lansman S, Khan N, Quintana C, et al. Looking for the artery of Adamkiewicz: A quest to minimize paraplegia after operations for aneurysms of the descending thoracic and thoracoabdominal aorta. J Thorac Cardiovasc Surg 1996;112:1202-13. Coselli JS, LeMaire SA, Miller CC 3rd, Schmittling ZC, Köksoy C, Pagan J, et al. Mortality and paraplegia after thoracoabdominal aortic aneurysm repair: A risk factor analysis. Ann Thorac Surg 2000;69:409-14. Martirosyan NL, Feuerstein JS, Theodore N, Cavalcanti DD, Spetzler RF, Preul MC. Blood supply and vascular reactivity of the spinal cord under normal and pathological conditions. J Neurosurg Spine 2011;15:238-51. Criado FJ, Abul-Khoudoud OR, Domer GS, McKendrick C, Zuzga M, Clark NS, et al. Endovascular repair of the thoracic aorta: Lessons learned. Ann Thorac Surg 2005;80:857-63. Chuter TA, Rapp JH, Hiramoto JS, Schneider DB, Howell B, Reilly LM. Endovascular treatment of thoracoabdominal aortic aneurysms. J Vasc Surg 2008;47:6-16. Weigang E, Hartert M, Siegenthaler MP, Pitzer-Hartert K, Luehr M, Sircar R, et al. Neurophysiological monitoring during thoracoabdominal aortic endovascular stent graft implantation. Eur J Cardiothorac Surg 2006;29:392-6. Jacobs MJ, Meylaerts SA, de Haan P, de Mol BA, Kalkman CJ. Strategies to prevent neurologic deficit based on motor-evoked potentials in type I and II thoracoabdominal aortic aneurysm repair. J Vasc Surg 1999;29:48-57. Coselli JS, LeMaire SA, Köksoy C, Schmittling ZC, Curling PE. Cerebrospinal fluid drainage reduces paraplegia after thoracoabdominal aortic aneurysm repair: Results of a randomized clinical trial. J Vasc Surg 2002;35:631-9. Acher CW, Wynn MM, Hoch JR, Kranner PW. Cardiac function is a risk factor for paralysis in thoracoabdominal aortic replacement. J Vasc Surg 1998;27:821-8. Hill AB, Kalman PG, Johnston KW, Vosu HA. Reversal of delayed-onset paraplegia after thoracic aortic surgery with cerebrospinal fluid drainage. J Vasc Surg 1994;20:315-7. Cheung AT, Pochettino A, McGarvey ML, Appoo JJ, Fairman RM, Carpenter JP, et al. Strategies to manage paraplegia risk after endovascular stent repair of descending thoracic aortic aneurysms. Ann Thorac Surg 2005;80:1280-8. Acher CW, Wynn M. A modern theory of paraplegia in the treatment of aneurysms of the thoracoabdominal aorta: An analysis of technique specific observed/expected ratios for paralysis. J Vasc Surg 2009;49:1117-24. Crawford ES. Thoraco-abdominal and abdominal aortic aneurysms involving renal, superior mesenteric, celiac arteries. Ann Surg 1974;179:763-72. Bicknell CD, Riga CV, Wolfe JH. Prevention of paraplegia during thoracoabdominal aortic aneurysm repair. Eur J Vasc Endovasc Surg 2009;37:654-60. Davison JK, Cambria RP, Vierra DJ, Columbia MA, Koustas G. Epidural cooling for regional spinal cord hypothermia during thoracoabdominal aneurysm repair. J Vasc Surg 1994;20:304-10. Cinà CS, Abouzahr L, Arena GO, Laganà A, Devereaux PJ, Farrokhyar F. Cerebrospinal fluid drainage to prevent paraplegia during thoracic and thoracoabdominal aortic aneurysm surgery: A systematic review and meta-analysis. J Vasc Surg 2004;40:36-44. Dardik A, Perler BA, Roseborough GS, Williams GM. Subdural hematoma after thoracoabdominal aortic aneurysm repair: An underreported complication of spinal fluid drainage? J Vasc Surg 2002;36:47-50. Wynn MM, Mell MW, Tefera G, Hoch JR, Acher CW. Complications of spinal fluid drainage in thoracoabdominal aortic aneurysm repair: A report of 486 patients treated from 1987 to 2008. J Vasc Surg 2009;49:29-34. Estrera AL, Sheinbaum R, Miller CC, Azizzadeh A, Walkes JC, Lee TY, et al. Cerebrospinal fluid drainage during thoracic aortic repair: Safety and current management. Ann Thorac Surg 2009;88:9-15. Keith CJ Jr, Passman MA, Carignan MJ, Parmar GM, Nagre SB, Patterson MA, et al. Protocol implementation of selective postoperative lumbar spinal drainage after thoracic aortic endograft. J Vasc Surg 2012;55:1-8. Hiratzka LF, Bakris GL, Beckman JA, Bersin RM, Carr VF, Casey DE Jr, et al 2010 ACCF/AHA/AATS/ACR/ASA/SCA/SCAI/SIR/STS/SVM guidelines for the diagnosis and management of patients with Thoracic Aortic Disease: A report of the American College of Cardiology Foundation/American Heart Association Task Force on Practice Guidelines, American Association for Thoracic Surgery, American College of Radiology, American Stroke Association, Society of Cardiovascular Anesthesiologists, Society for Cardiovascular Angiography and Interventions, Society of Interventional Radiology, Society of Thoracic Surgeons, and Society for Vascular Medicine. Circulation 2010;121:e266-369.